Thinking of planning a trip to Chicago? Good choice. (It’s a fantastic city, after all.) And, there’s no better time to visit than in fall when the leaves are changing colors and the air is crisp and fresh, without being too cold. So, if you are taking trip, you’ll want to be prepared and hit all the hotspots and take in the city for its finest attributes and cultural elements. Here are 5 must-visit places in Chicago to get the full city experience. Besides, if you can’t tackle them all, you can always come back again, right? If you’re looking to see some fabulous exhibits and get a better understanding of Chicago’s rich arts and culture scene, The Art Institute of Chicago is the place to go. You’ll get the chance to see fantastic works from leading artists across various genres and themes, and you can even take classes and workshops for a deep dive into specific artistic platforms and representations. 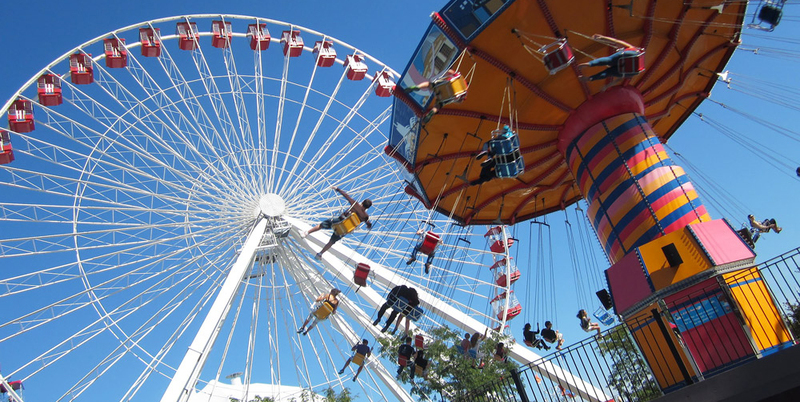 If you’re in Chicago, you can’t leave before heading to Navy Pier for a day full of adventure. (Plus, it is super family-friendly, if you’re traveling with kids.) While you can choose from different rides, beer gardens, restaurants, and movies and performances, you’ll need to take a stop at the renowned Ferris wheel, of course. What’s more, there are often events and festivities going on, so be sure to check the calendar when you visit to see if anything sparks your interest! Get this: You can see Chicago from 1,000 feet above ground when standing on top of the John Hancock building, overlooking the Chicago skyline. Boasting 360-degree views, you can literally see everything. Could there be a better way to take in Chicago’s beauty and architecture? And, you can even do yoga, painting, and happy hours from above. If you’re visiting Chicago, you can’t leave without seeing Millennium Park. From taking selfie shots in front of the Bean to taking a dip in the water and seeing local Chicagoan faces on the screen of the Crown Fountain, there’s so much to do and explore. And, if you happen to visit during warmer temperatures, you can even take in musical performances and outdoor festivals.